Smithsonian National Museum of African Art. 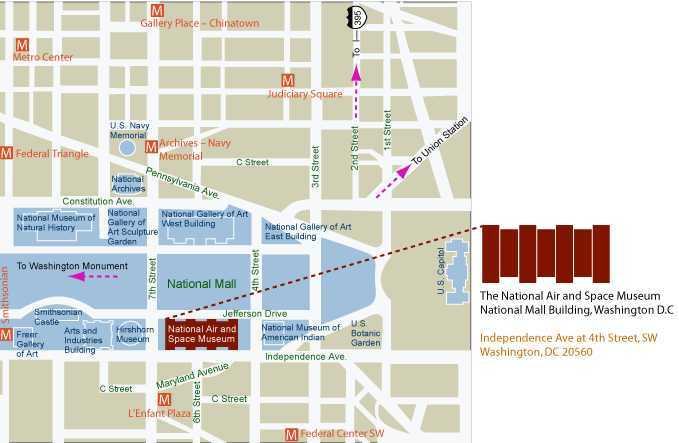 There are many Smithsonian Museums on both sides of the National Mall. FAA Building, U.S. Department of Transportation Federal Aviation Administration, 800 Independence Avenue, SW.
One area where they have some street vendors is on Independence Avenue. Another Old Town Trolley tour bus going by, which I took during my first hours in Washington, DC. The engraved name of the Smithsonian National Air and Space Museum on the right side of the building entrance. One more of the building name. Looking at the main inside counter where you purchase tickets for the theater and shuttle bus to the other museum at Dulles Airport. Spirit of St. Louis (Ryan NYP Aircraft) Charles Lindbergh. The Spirit of St. Louis was a custom airplane used by Charles Lindbergh to make the first solo, non-stop trans-Atlantic flight on May 20 and May 21, 1927. Charles Lindbergh took off from Roosevelt Airfield in Long Island, New York and landed at Le Bourget Aerodrome in Paris, France. The flight lasted for 33 hours, 30 minutes and 29.8 seconds. Spirit of St. Louis (Ryan NYP Aircraft).